From the author of The Wishing Tide comes a stunning new novel about two summers, one journal, and the secrets that can break and open our hearts.... Pragmatic, independent Lily St. Claire has never been a beachgoer. But when her late father leaves her a small house on Hideaway Key—one neither her mother nor she knew he owned—she’s determined to visit the sleepy spit of land along Florida’s Gulf Coast. Expecting a quaint cottage, Lily instead finds a bungalow with peeling shutters and mountains of memorabilia. She also catches a glimpse of the architect who lives down the beach…. But it’s the carton of old journals in the front room that she finds most intriguing. The journals were written by her mother’s sister, an infamous beauty whose name has long been banned from the St. Claire home. The journals tell a family tale Lily has never heard, of her mother and her aunt as young girls in Tennessee and the secrets that followed them into adulthood. As she reads, Lily gains a new understanding: about her family and about herself. And she begins to open her heart—to this place, these people, and the man next door. But can she ever truly learn to trust, to believe that love is not a trap but a harbor? And is it true that hearts, even broken ones, can be forged anew? Do you ever just read a book that is sort of out of your comfort zone because you are in a rut and just really need something completely different to get you out of that rut? I read Summer At Hideaway Key by Barbara Davis because I was in a sort of young adult rut and I know the best way for me to keep it fresh is to try different books from different genres. It is why we post such a wide variety of reviews here at Good Books and Good Wine headquarters. Y’all, this book was rut-busting, as they say. I thought it was just going to be my down time Kindle book, but it ended up being my front and center book. I got completely sucked into this book which was so unexpected but completely appreciated. 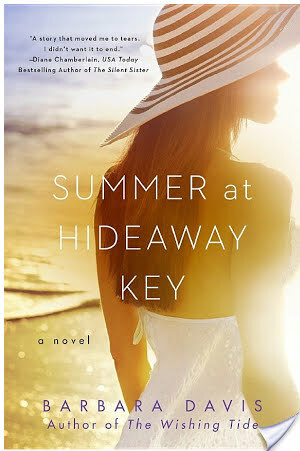 I have to say, I really enjoyed Summer At Hideaway Key and actually kind of look forward to supplementing my steady diet of young adult fiction with women’s fiction and more genres. So, this book, it is so dramatic and engaging. Summer At Hideaway Key by Barbara Davis opens up with an italicized chapter from the past – two young girls are being dropped off by their mother to a poor farm. They assume she’s coming with them, but she drives off and never looks book. This takes place in the 1950s or so. I could be wrong. Anyways, after this short introduction chapter, we jump ahead to 1995 which FYI does not feel like 20 years ago to me, but still only 10 years ago. Is this what being old looks like? Anyways, so in 1995 Lily St. Claire is a 35 year old fashion designer and she is with her mother at the reading of her father’s will. There is quite a sizable amount of stocks and bonds and assets to be divided up which is expected. What is unexpected is that Lily inherits her estranged aunt’s cottage – Sand Pearl Cottage located in Hideaway Key, Florida. Lily is not the beach going type, but she is curious about the aunt that she never knew and so, she heads on down to Florida to sort through the cottage and to get some answers. Hoo boy does she get answers. While there, Lily uncovers the journals of Lily-May, her aunt, and discovers some long kept family secrets. She also makes friends with the locals and begins a no-strings romance with next door neighbor, Dean. I won’t lie — I was not quite sure if I would be able to relate to Lily. I am 28 and she is 35, nearly 40, and very successful. Meanwhile, I’m over here still eating Captain Crunch for breakfast. So, naturally I was like I have nothing in common with Lily who is an actual grown up doing actual grown up things. Turns out, I was not entirely accurate. You see, Lily is compelling. She does not let herself fall headlong in love. She never feels quite right. She seems almost uncomfortable in her skin. And she’s restless. Her father gave her the advice to follow her true North, but unfortunately, it is obscured for Lily. I liked this. I liked that even though she appears to have it together, she is just as much of a mess as the rest of us. I liked that she didn’t let people get super close to her. I like that she calls her mother out. I like that the secrets and revelations she finds profoundly affect her. She’s sort of the grown up version of a YA contemporary character and I LOVE IT. I think what compelled me the most were Lily-Mae’s chapters. In Summer At Hideaway Key, Barbara Davis incorporates a dual story line. Lily-Mae’s chapters are told by journal entry. They completely sucked me in. I mean, yes, Lily is interesting and has a whole host of issues. Lily-Mae, however, takes the cake. This girl. First off, she is dropped off at a poor farm with her sister. There, they perform slave labor for a jerk face man named Harwood Zell. It is the worst. Zell even goes after Lily-Mae, and like plenty of men in power, forces himself on her. It is a traumatic experience, but she endures it because she wants to protect her sister, Caroline, from being abused. There’s a lot of pain and anguish to unpack in Lily-Mae’s section. It almost reads like a modern day Jacob and Esau, but between Lily-Mae and Caroline. Just, agh, this section is worth reading the book for. Not that Lily’s section is not superb, I just found Lily-Mae’s journals to be above and beyond fascinating. If you are a young adult reader who is an actual adult and maybe looking for a break from teenagers, I think this is a great book to get your feet wet. Summer At Hideaway Key is well written. It is chock full of interesting characters and most important, DRAMA. It is exciting and romantic. And just, a really great escapism sort of read. I definitely would recommend this book to fans of Jodi Piccoult – only there isn’t a BS moral dilemma in this book. There is a real and actual ending. I just am super satisfied with this book and give it my seal of approval for sure. Well, I’m sold. This sounds pretty great–excellent review! I am just about to finish this book.